AdGuard for Windows certainly can be this app. You install it and BAM, ads are gone immediately and your personal data is well protected. But "Install and forget" is not always the best way to go, since app's capabilities aren't used to their full potential in this case and lots of useful and even necessary features may be left unnoticed. and other. Further we will look at each of them more closely. AdGuard's main job, without any doubt, is blocking ads, and responsible for this task is Ad Blocker module. It is a popular opinion that AdGuard uses magic to block ads, but it is, in fact, not true. Ad blocking is possible thanks to filters, which make up the "core" of ad blocker. Filters, in their turn, consist of lists of rules written in special syntax. These rules tell ad blocker what exactly and how to block. AdGuard team develops and supports a range of own filters, but you also have an option to choose any from dozens of third-party filters available by default, or even add your own (we'll talk about it a bit later). In the Ad Blocker settings you can enable and disable any filters as you see fit. We'd like to emphasize that we do not support any kinds of so-called "acceptable ads" programs. This is 100% optional and we have strict criteria for which ads fall under this definition — only search ads and self-promo ads. More detailed explanation is present in this article. You'll also notice two buttons inside the Ad Blocker settings — "Filter editor" and "Filtering Log". What are they? Filter Editor is a tool that allows to peek "under the hood" and work with filters on the individual rules level. At the very top of the filter list you'll see a User filter. As it is clear from its name, this is a unique filter that provides an opportunity to add your own filtering rules. If you don't know how to create your own rules, or just want to refresh the knowledge, feel free to consult the KB article. In the Filtering Log are displayed all web requests that go through AdGuard. For your convenience they are highlighted with different colors (for example, blocked requests are highlighted with red). This way, it's very easy to track what's been blocked and what's not. Filtering Log is essential to create your own rules and mostly exists to help advanced users. Finally, as it was promised, I'll briefly tell how to add your own filters. In the very bottom of the "Ad Blocker" settings screen there is an "Add filter" button. After pressing it, you will find not only a list of available filters, but also a button to add a filter from the web by URL (convenient if your favorite filter is not present in the default list). You can even create a new filter from scratch by clicking on the "Add custom" button! One of the obvious advantages of AdGuard for Windows is that it blocks ads in all browsers. But did you know that it can also block ads and tracking in other apps? "Filtered Apps" section contains the list of almost all known browsers and some apps — all of them will be filtered by default. You can also add an executable (.exe) file of any other app to filter it too. But be careful, there can be several executables for one app. Sometimes you need to add them all, and sometimes only one — really depends on the app. If in doubt, you can always consult us or other users in our Telegram chat. Also worth mentioning that some apps can be incompatible with AdGuard — in this case just remove the app's executable file from the "filtered apps". The Stealth Mode module protects your personal data from numerous online trackers and analytical systems. On the screenshots of Ad Blocker you probably noticed the Spyware Filter. This filter is generally enough to protect yourself from online surveillance. However, the Stealth Mode module significantly expands the possibilities and takes your online privacy to a new level. Stealth Mode's plentiful options allow its flexible configuration. They are divided into several categories, and for an unprepared user many of them will seem confusing. This is why we accompanied each option with a hint that appears when you hover over the icon with a question mark. It is worth noting that turning on some of the Stealth Mode options can sometimes lead to the incorrect behavior of certain websites — this is the inevitable price for ensuring your privacy online. Phishing is one of the most unpleasant and widespread types of online threats, the purpose of which is to gain access to confidential user data (logins and passwords, email addresses, etc.). To do this, scammers use fake web pages that mimic the design of popular sites or existing network services. 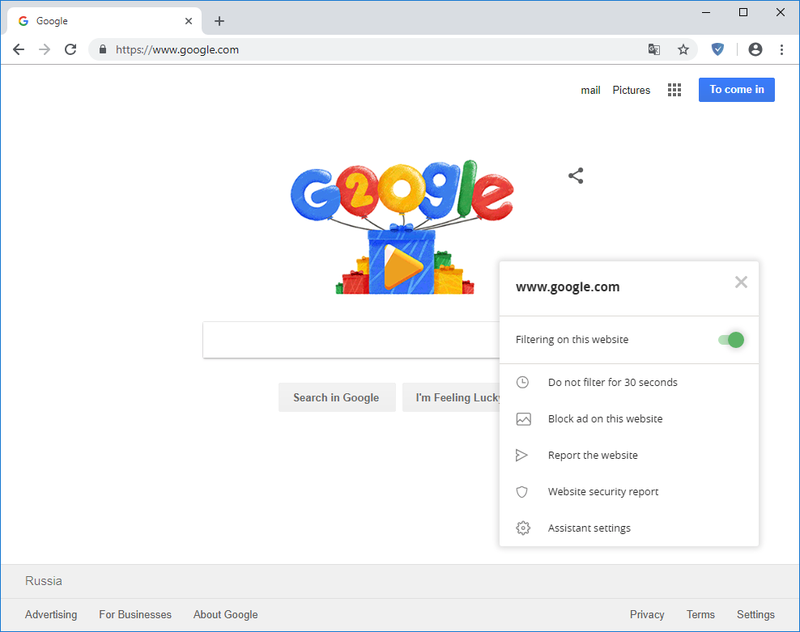 Fortunately, the Browsing Security module reliably protects you, not only from phishing threats, but also from potentially virus-infected pages. Regularly updated databases ensure that all malicious resources will be recognized and the app will warn you in time if you try to access a dangerous site. Note that your personal information is not transmitted anywhere, and AdGuard servers do not know what sites you are visiting because we don't check websites' URLs, but rather their hash prefixes (hash is a definite data structure, uniquely identifying each address added to the database). Unlike browser extensions, the Browsing Security module scans each embedded object on the web page, thereby providing the maximum degree of protection. In the settings of Browsing Security, you can enable or disable notifications about blocked requests, manage their sound notification, and choose to participate in the development of the Browsing Security module, if you'd like to. However, it should be noted that the Browsing Security module is not a replacement for the antivirus programs. Despite the fact that it is able to prevent the access to potentially infected sites, it will not protect your computer from downloading viruses or delete the existing ones. The Parental Control module provides children with protection from adult content on the web. You can activate Safe Search, which will exclude adults websites and other inappropriate content from search results on all popular search engines such as Google, Bing and Yandex. You can also prohibit the loading of executable (.exe) files, this will prevent your kids from installing any potentially dangerous programs. In the module settings, you can also set the appropriate sensitivity level, create a password to stop your child from accessing the settings or turning off the app, and configure black and/or white lists. The next on the menu is the "Extensions" section in which you can manage userscripts. AdGuard Popup Blocker prevents popup windows from opening when you view web pages, and AdGuard Assistant helps users manage AdGuard right from the browser. AdGuard Assistant works with all Microsoft Windows compatible browsers and is represented on all web pages by a little icon with a shield, except for few websites which are listed as exceptions (if there is a risk of incorrect content display). With AdGuard Assistant you can choose enable or disable filtering on a site, manually block any element in a couple clicks, pause filtering for 30 seconds, check website security and/or report the website (e.g. missed ads). Speaking about AdGuard Assistant, I would like to focus on one important point — the integration mode. So, what is that? The Integration mode is automatically enabled when AdGuard for Windows works in conjunction with AdGuard browser extension. How does AdGuard extension's work change in integration mode? AdGuard browser extension, while in integration mode, can serve as a very useful tool that can completely replace the Assistant (for example, if you don't like seeing the icon on the page but still would like to have access to its functions). In the AdGuard for Windows settings, you will also find the "Network" tab, which provides you with some advanced configuration options, including proxy settings. They are mostly intended for more advanced users and this is why we do not recommend you to change them if you are not completely sure what exactly you are doing. Now let's go through some of the "General Settings" which can be found at the very top of the application settings list. Here you can choose the app language, export or import AdGuard settings (for a faster switch between the settings profiles or to transfer your profile between the different computers), and also select an update channel, i.e. a mode in which the application receives its updates. At the bottom of the AdGuard window, you will also find the License section where you can enter or renew your license key and check the license status, and the Support section which helps you to quickly contact the 24/7 helpdesk. Despite all the internal and beta testing, sometimes things just don't go quite as you expect them to after a release. This happens even to the largest of companies, not to mention AdGuard. What separates good developers from not so good ones is how fast they react to the unexpected difficulties. We'd like to think we are among the former ones, that's why we don't shy away from hotfixes if the situation calls for it.